Say goodbye to metal braces! At Fischer Family Dentistry, we’re a preferred provider of Invisalign. This nearly invisible treatment will align your teeth without the discomfort, and expense of traditional braces. It’s also a great option for adults who worry about the appearance of metal braces. With Invisalign, you can straighten your teeth quickly, and discreetly. 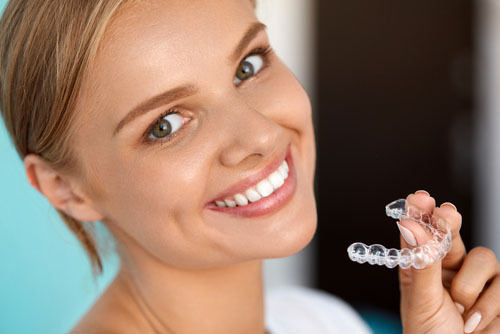 Invisalign uses a series of clear plastic aligners. They’re custom made to gradually move your teeth into place. Every two weeks, you’ll change them out for a new pair. As time passes, you’ll notice your teeth becoming straight. We use 3D technology to create your treatment plan, and shape the aligners. You can wear them all day without changing your appearance. Invisalign is comfortable, safe, and affordable. And you’re the only one who knows you’re wearing them! They’re removable, so you can take them out to eat, drink, brush, and floss. This means you can eat whatever you want! It also makes cleaning your teeth a breeze. With regular braces, cleaning around the brackets can be a pain. With Invisalign, there will be no changes to your oral hygiene routine. With the Invisalign system, you should visit the dentist every 6 weeks for a check up. That’s far less often than you’d visit with traditional braces. There are no painful adjustments, or gum irritation. And they can be used for minor or major adjustments. 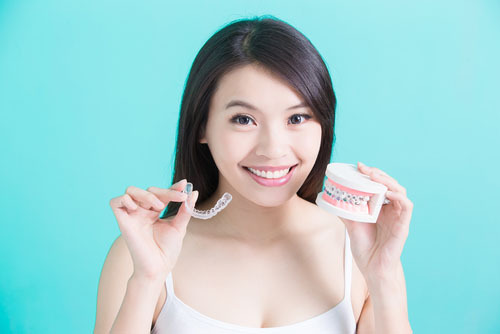 Lots of adults are wary of the look, and cost, of traditional braces. The prospect of spending up to two years with metal braces is off-putting for many. We’ll use Invisalign to straighten your teeth and improve your confidence without the hassle of metal braces. Don’t wait any longer to have the smile you’ve always wanted.